Earlier this year, Noe Valley saw its record-setting most expensive home sale ever, 625 Duncan (March 2014), matched by 553 Elizabeth (June 2015) — each sold for $7M. [Note: 625 Duncan was then partially gutted and re-sold in April 2015 for $4.4M.] That same month, Noe got its new next priciest sale at 471 Hoffman, sold for $6.7M. 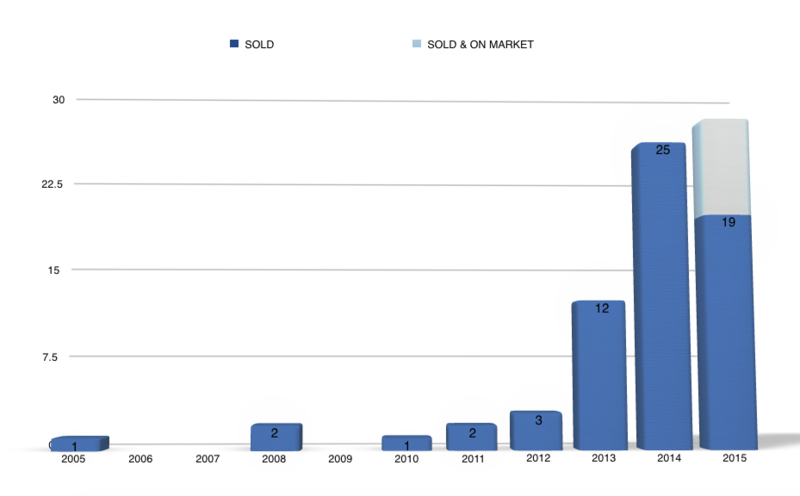 In all, 19 $3M+ single-family homes in Noe Valley have sold YTD — compare that to 23 in Pacific Heights. At various times over the past decade, the average $/sqft sales price in Noe Valley has exceeded that of Pacific Heights, both with consideration to all property types sold and also individually to homes, condos, and TICs leading to some dramatic comparisons between the two neighborhoods. In 2013 it was said “Pacific Heights is cheap compared to Noe Valley” with regard to particular $/sqft figures, and last year it was declared “Noe is the new Pac Heights” following a measured shift of dominance in the number $2M+ single-family home sales from the “Prestige North” to the Noe, Eureka and Cole Valleys. With regard to median sales prices for single-family homes, Noe Valley led the whole of San Francisco in surpassing the $1M mark by almost five years. Not since May 2009 has the neighborhood seen a six-figure median for houses, and today close to 95% of all properties there — houses, condos and TICs — are valued at $1M+ according to this Zillow report. In fact, having grown from 54.26% in January 2010, the number of $1M+ properties as a percentage of all housing stock in Noe Valley today is the 3rd highest in the city, trailing Inner Sunset (95.67%) and Central Richmond (95.64%). Pacific Heights comes in 4th at 88.24%. 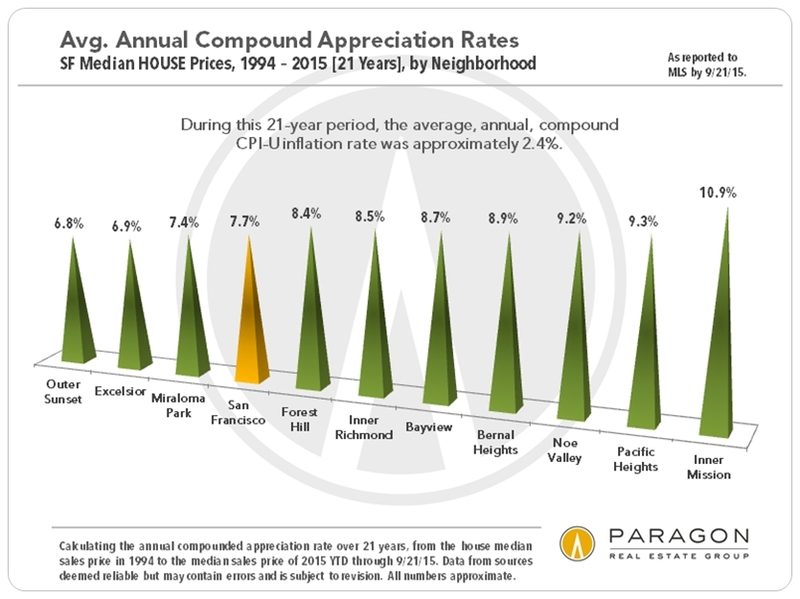 While neither Noe Valley nor Pacific Heights could claim the highest average $/sqft for houses in September 2015, the spread between their prices — $1,334/sqft and $1,509/sqft, respectively — is relatively small. And while Noe is only one of a handful of neighborhoods in the southern part of San Francisco to experience some of the highest average annual compound appreciation rates in the long term, none of the others come close to touching the “Prestige North” — in terms of ultra-luxury house prices, average $/sqft figures, median single-family home prices, percentage of $1M+ properties, number of $3M+ homes sales or otherwise. With Noe Valley’s easy access to Silicon Valley, it’s proven to be a desirable area for wealthy tech-employed homebuyers. Furthermore, the neighborhood’s limited capacity for infill luxury housing developments means that any existing structure is an appealing candidate for renovation, expansion and/or rebuild for 21st century sensibilities. Looking at the $3M+ single-family homes sold this year as well as ones currently on the market, it’s evident the neighborhood is experiencing a wave a mansionization every bit as worthy of “Prestige” as Pacific Heights. In The New Mansions of Noe Valley: Part II, we’ll take a look at some of these properties and offer a professional’s analysis of the draws for these mansions that tech built. Stay tuned!